History, the weather and the sea are all muses of mine – which is why this postcard is one of my favourites. It shows stormy waves pounding Nelson’s Rocks Road, a scene that I’m very familiar with. Nelson was founded in 1841 by the New Zealand Land Company and the coastline that would become Rocks Road was witness to some fantastic episodes of local history. 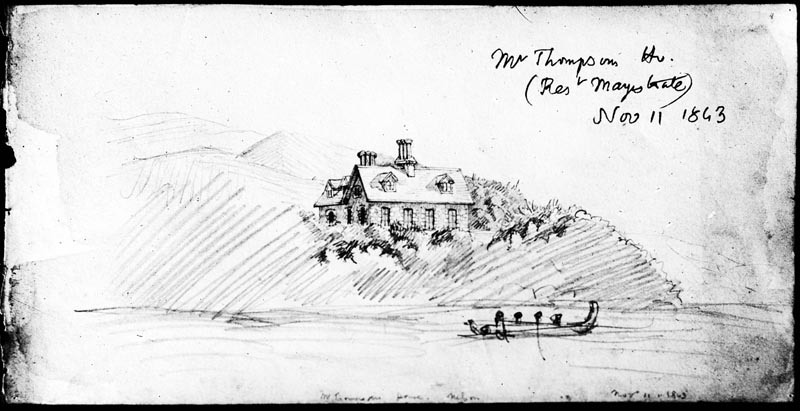 At the Tahunanui end it passes the largely forgotten site of the house of Henry Thompson, the Chief Magistrate of Nelson who would meet his end at the Wairau. Further along it looks out to Fifeshire Rock, named after the settler’s ship that made an unscheduled stop there. The road itself was carved out of the cliffs using the best means available to late 19th century engineers – explosives and convicts. As a youngster I used to deliver a weekly community paper along Rocks Road and I have fond memories of cycling along the waterfront during raging storms. Often I would deliberately ride right next to the waves – daring the sea to knock me off my bike. Rogue waves were responsible for several soggy newspaper deliveries and in extreme events would even smash the windscreens of passing vehicles. Sometimes it would get so bad that the council would temporarily close the road and let the sea claim it back for a few hours. So it isn’t too surprising to see a photo of large waves breaking over the road, which in 1910 was still a relatively new feat of coastal engineering. This postcard inspired me to do a bit of digging to see if I could find any weather reports for that particular storm. Luck would have it that Papers Past has digitized the Colonist – one of the local Nelson newspapers from that time. It reports that early in the morning of March 14th 1910 that a “fierce northerly gale, accompanied by torrential rain” combined with a particularly high tide. The results were predictable with damage to port facilities, railway lines and flooding on many streets. “The full force of the gale was felt along Wakefield Quay towards the Rocks Road, and the damage done to the sheds and other buildings on the foreshore is considerable. At the Albion wharf the sea dashed over the decking with great fury, washing away about forty tons of coal that was stacked there. But for the great weight of coal on the wharf the whole structure might have gone”. The Colonist reports that it took a couple of days for the floodwaters to fully subside from Wainui, Weka and Trafalgar Streets with one poor resident having “a foot of water in his piano”. The photograph of the storm hitting Rocks Road was one of a series taken that morning by pioneer photo-journalist Frederick Jones. Both the Turnbull Library and Nelson Provincial Museum have many of his original negatives, which form a fantastic record of life in Nelson during the early 20th century. Here is another of his views of the storm which is even more spectacular! Ironically Nelson is well-known for its beautiful sunny weather, especially in the summer when it turns into a Mecca for holidaymakers. But once in a while the elements will contradict a regional reputation – I’m hoping for just that this coming Wednesday as I need clear skies over Dunedin so I can witness the Transit of Venus. More on that soon. Incredible photos Lem! Thanks for sharing.